We’ve already given you the basics of matched betting, so let’s look at it in a bit more detail now. A lot of the information in this post could seem a bit daunting at first…But don’t let this put you off! You won’t need to worry about any of the maths involved, as our calculators do all that for you. Matched betting requires us to place 2 bets every time we want to complete an offer. We have the qualifying (back) bet and the lay bet. Let’s take a simple sign up offer as an example: Bet £10 to get a £30 Free Bet. This is the first bet we have to place at the bookmaker. In our example, this is our £10 bet. We need to place this bet in order to unlock the £30 free bet. Under normal circumstances we would be risking that £10, but with matched betting we’re going to place another bet (the lay bet) to make sure that we don’t lose money, no matter what happen the outcome of the bet is. For this example we’re going to pretend we’ve placed a £10 bet on Manchester United to beat Chelsea. This is the second bet we need to place and it’s what cancels out our qualifying bet. In a simplified example, a £10 back bet would be cancelled out by a £10 lay bet. As we have placed a back bet on Manchester United to beat Chelsea, we now need to place our lay bet against Manchester United beating Chelsea. This means that we’ll have covered all outcomes. If Manchester United win, our back bet wins. However, if they don’t win, then our lay bet wins. A draw would mean our lay bet won, as a draw isn’t a win for Manchester United. So no matter what happens, we win one bet and lose the other. We break even, but we’ve also unlocked our £30 free bet. Let’s look at this again with some real life odds to give you a real idea of how this works. Using the OddsMatcher you can find on any of our guides pages, we’ve chosen a bet of Leicester vs Southampton. The selection is a draw. We can see the back odds in blue and the lay odds in pink. That’s the easy part out of the way. Now, we need to do a quick calculation on our matched betting calculator to work out the lay bet. So, as we can see, the back odds and the lay odds are slightly different, which means our lay bet won’t be exactly £10. Plus, we need to take into account that Betfair charges commission of 5% on winning bets. But don’t worry about working all of that out – the calculator does all this for you. Simply enter the odds and your stake. As you can see on the calculator, we have entered our £10 stake and then the back odds and lay odds, as well as 5% for Betfair’s lay commission. The calculator tells us we need to place a lay bet on our selection of £9.86. It also tells us that our liability is £26.82. Liability is the amount of money we need in our Betfair account in order to place this lay bet. Our overall position once this match is complete will either be -0.62p or -0.63p. This small loss is expected but nothing to worry about as we make a much larger profit with the free bet. This is known as the qualifying loss. It’s usually a few pence loss but can sometimes be a few pence profit, depending on the odds. So we can now head over to the exchange and find our bet. Log in to Betfair and make sure you have enough money to cover the lay bet. Once we click that it will be added to our betslip. We enter the stake of £9.86 as advised by the calculator (you will see the liability also matches what it said on the calculator) and click place bet. We have now placed both our bets and can sit back and wait for this match to finish. At the end of it, no matter what happens, we will win one bet and lose the other. Our money will either go into the bookie or the exchange and in total we will be about 62p down. Now that is complete, the bookmaker will award us our £30 free bet. This is where we make our profit. Now that we have our free bet, we need to repeat the exact same scenario as above, but this time we’ll be using free money instead. We will still have to use our own money to place the lay bet, but no matter the outcome, we will be in profit. Using the OddsMatcher on the guide page again we can find a good bet to use our free bet with. Tottenham v Inter looks good. The selection is Inter. So we go back to Betfred and place a £30 back bet on Inter to beat Tottenham. Remembering to select the free bet on the bet slip, do not use your own money here. Now we need to use the calculator again. This time though, we’re going to change the mode on the calculator from ‘Normal’ to ‘Free Bet (SNR). 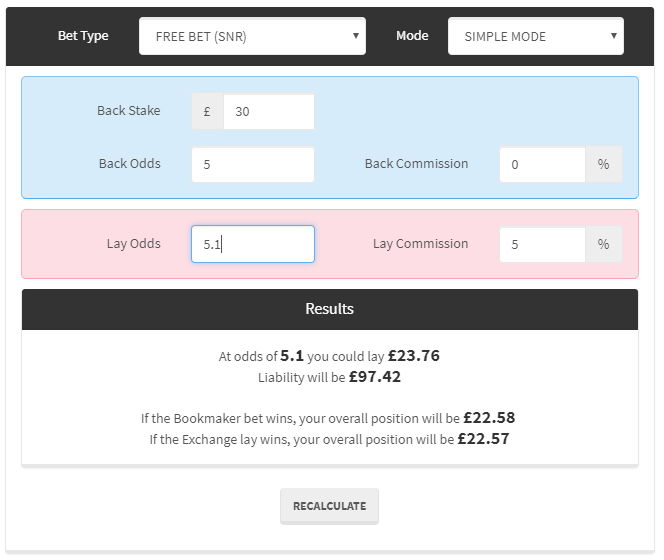 This lets the calculator know we’re using a free bet and adjusts the maths it uses to work out the lay bet accordingly. Again, we’ve entered our stake (£30) and the odds – remembering to check that commission is 5% and that the Bet Type is now FREE BET (SNR). The calculator tells us to place a lay bet of £23.76. So again, we head to Betfair and find our selection. 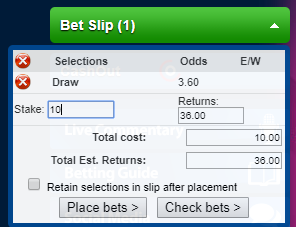 Press 5.1 to add the bet to the betslip, then enter the stake as advised by the calculator. Again the liability matches what the calculator said it would. The liability is a lot higher for this bet as we’re using higher odds and a higher stake. Make sure you have enough in your Betfair account to cover the bet. Once you’ve placed that bet, we’re done. You have just made easy money from the bookies. No matter the result of the Inter vs Tottenham game we have locked in a profit of £22.58 if Inter win or £22.57 if Inter fail to win. After we deduct or qualifying loss of 67p that leaves us just under £22 in profit. After reading all of that you might be thinking the process is very long winded to make £22. However, all of this can be done in a few minutes. Plus, as you can see, you don’t really need to worry about the numbers involved with odds and stakes, as the calculator and guides tell you exactly what you need to bet. All you have to do is choose what you’re going to bet on using the inbuilt odds matching software found on every guide page. You can now repeat this process over and over again with every bookmaker you can find. We advise following our guides, as the amounts and odds required vary from offer to offer, but the main process is the same. In a few minutes you can use this process to lock in profits over and over again! Now that you have read through these first 5 guides you are ready to start making some money. By signing up for a free account you can start working your way through all the offers and mark them complete as you go. It’s really easy so why not get going today and start earning some free money!